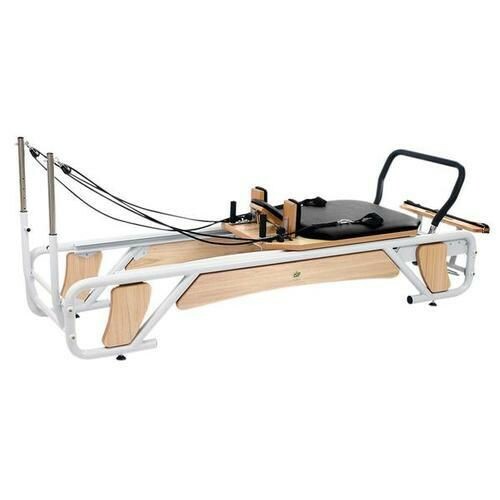 Stark Pilates Reformer by 3B Scientific W15402 is designed for rehabilitation and muscle strengthening. It is made from eucalyptus wood and carbon steel. It has a bold-modern finish, is highly stable, and durable. It comes with a pair of foot straps, hand handles, and ropes with rings. It includes 2 green high density springs, 2 blue medium density springs, and 1 yellow low density spring. It measures 8 ft x 31 inch x 20.5 inch and has a maximum user weight capacity of 330 pounds. A pilates reformer can have a dramatic impact on the body in great ways. It is a high-quality piece of home exercise equipment that promotes flexibility, balance, coordination, and strength. It improves physical imbalances and eases muscle pain. It is designed to help tone muscles and is large enough to accommodate a full-range of motion. Exercising with a reformer is ideal for anyone at any fitness level.